Not a lot of time to post today, still covering for my coworker. Today I made croquettes out of leftover mashed potatoes. The croquettes have a little piece of fresh mozzarella inside, so they will be a little cheesy as well. Also in this box: cherry tomatoes and watermelon from Ridgeview Farms, baby carrots, and slices of Armenian Cucumber from Redwood Empire Farms. I also have a little container of meaty tomato sauce to go with the croquettes. I got this box at Daiso in Seattle's Westlake Mall. I love it! 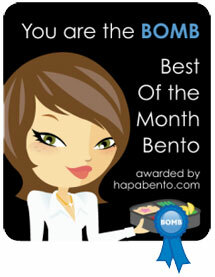 I have added this bento to hapa bento's September B.O.M.B. challenge. Potatoes feature greatly in my fall food repertoire. 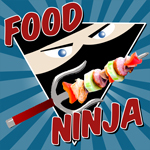 Check it out and submit your own fall foods bento. Croquettes with mozzarella? Sounds SO good! I love the taste of it. Oh...I love this too. Just think of to try this also. 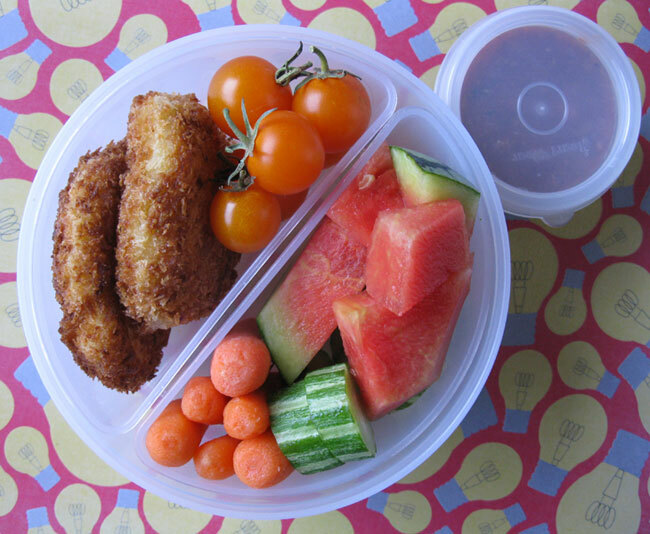 :) Nice and yummy bento. Wish you good luck on the Sept. BOMB. how come your croquettes look so good and perfect you could pass them as store-bought and mine look like big uneven lumps of potato and breadcrumbs? Nice work and love the cheese inside idea. Just what they need, I think! wow, cheesy and starchy with savory sauce on the side - right up my alley! 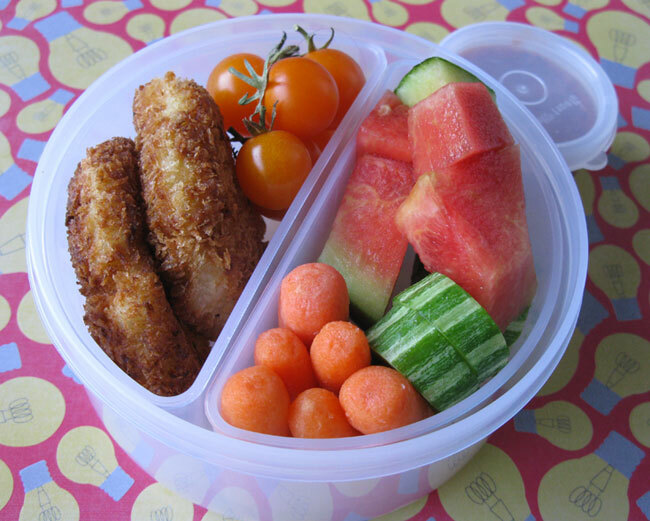 i need to try my hand at home-made croquettes for sure. I love Armenian cucumbers. They're a bit drier inside than some other varieties, which makes them better for dipping, and the ridged skins look like flowers when you slice them. I'm thrilled that after thinking my one-and-only Armenian cucumber vine had died during the cold spell, it came back to life with the latest heat-wave, and it looks like I'll still be eating cukes for the rest of the month. Seeing as how it's October, maybe I'll call them ZOMBIE cucumbers. By the way...this morning I was at the Dollar Store (next to Walmart in Rohnert Park) and they had some cute little animal-head containers for a buck each (of course). Not for heavy-duty use, but you'd get at least a buck's worth of photo op's out of them. Thanks Ty! Make sure they are not too wet, or else the potatoes will not hold together well. Ha Kelly, you should have seen the croquette I fed to my husband. Sad and lumpy. But it tasted good! Thanks Megan! The combo of cheese, potato, and yummy tomato sauce was killer. Hi Naomi! Thanks for the tip on the Dollar Store. And I am in love with Armenian Cukes too. They are sooo good. That sounds delicious! We will definitely have to try making potato croquettes. Thanks Rebecca! Croquettes are fairly simple, but be sure to have firm mashed potatoes--otherwise they may fall apart.